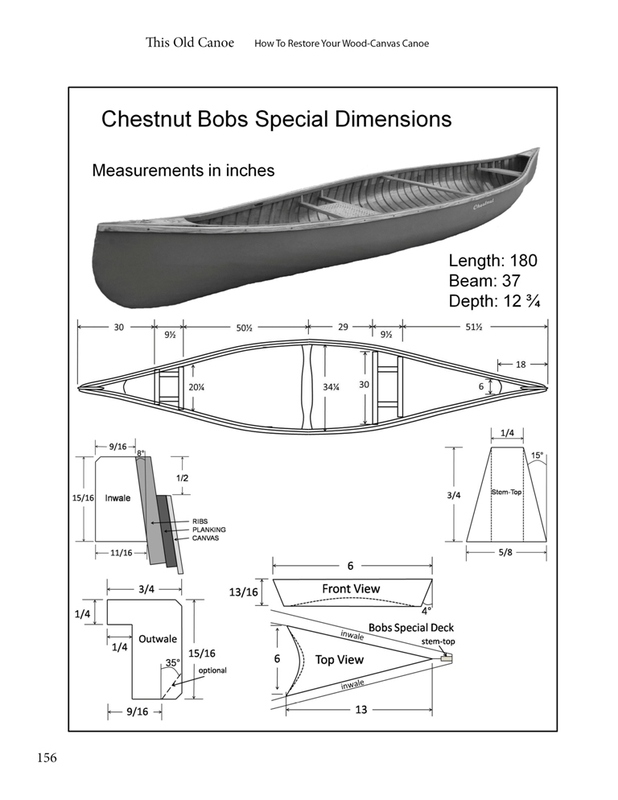 A complete guide to wood-canvas canoe restoration. To purchase the book in the USA, CLICK HERE. Contact me for a specific signed message. This Old Canoe: How To Restore Your Wood-Canvas Canoe is a step-by-step guide through the process of transforming an old, forgotten canoe into a cherished, classic heirloom. 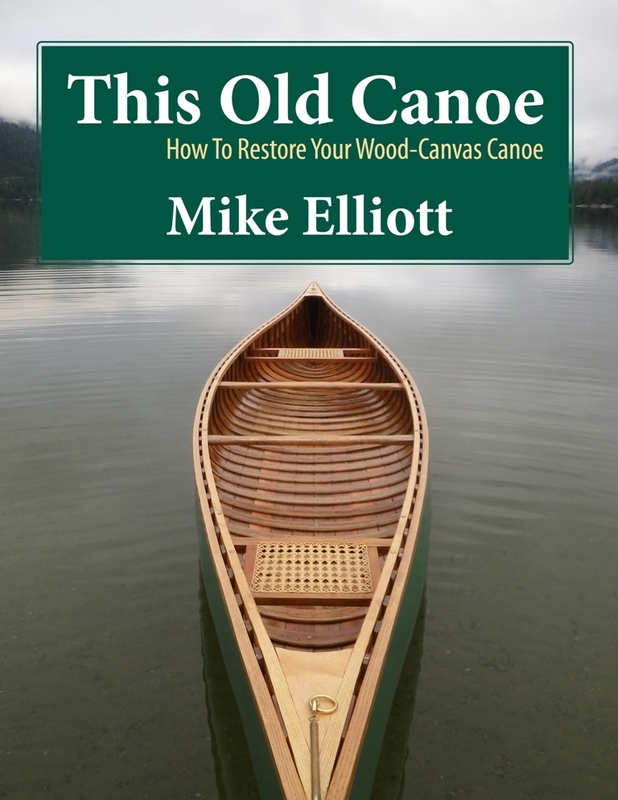 Where other DIY canoe books concentrate mostly, if not entirely, on building wooden canoes, Mike Elliott focuses solely on the challenges faced by the canoe restorer. This Old Canoe provides information and techniques useful to anyone wanting to know about these old wooden masterpieces. 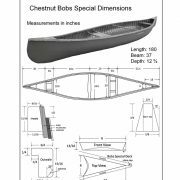 Besides people wishing to restore, anyone building a cedar-epoxy “stripper” using lines taken from vintage models will be able to fit out their new canoe with exact replica components (such as decks, seats, thwarts) found in the original. 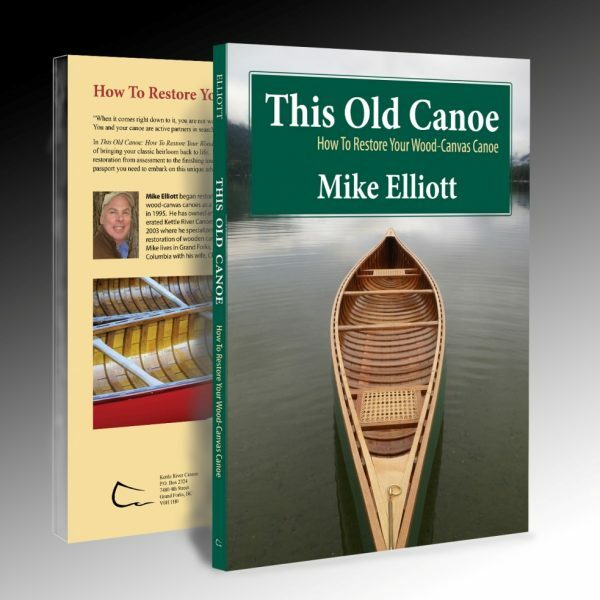 Besides all of the technical information, Mike includes a number of stories about old wooden canoes, their people and the restorations that brought them back together again. These stories help put a human face on the process of canoe restoration and gives you hope that almost any canoe is repairable when you follow the directions in the book. wood canvas canoe restoration and repair, cedar canvas canoe, wooden canoes for sale, canoe repairs in BC, Vancouver Island, Okanagan, Boundary, Kootenays, Peace, Chilchotin, Caribou, Columbia Region, Alberta, Saskatchewan, British Columbia, Washington, Oregon, Idaho, Montana Chestnut Canoe, Chestnut Pal, Chestnut ector, Chestnut Cruiser, Chestnut Freighter, Chestnut Twoser, Chestnut Ajax, Chestnut Ogilvy, Chestnut Bob Special, Bob’s Special Bobs Special Peterborough Canadien, all-wood, cedar-strip, Peterborough Canoe, Peterborough Minetta, Peterborough Mermaid, Peterborough Cruiser, Peterborough Champlain, Peterborough Cedar Strip Canoe, Peterborough Rib and Batten Canoe, Peterborough model 44 canoe, model 20 canoe, Canadian canoe, Richardson canoe, Bastien Bros. canoe, Faber Canoe, Gros-Louis canoe, Big Chief canoes, Huron canoe, Huron Village canoes, Loretteville, Tremblay canoe, Yaho canoes, Greenwood canoe, Greenwood Prospector, Bill Greenwood built exquisite canoes in Richmond, BC (on Mitchell Island) from 1934 to 1975. He based his canoe designs on Old Town Canoes in Maine, so his canoes are essentially Maine Guide Canoes — very stable with wide, flat bottoms — all trimmed in Philippine (Luan) mahogany. This Old Canoe How To Restore Your Wood Canvas Canoe book, canoe repair and restoration book, E.H. Gerrish canoe, E.M. White Canoe, B.N. Morris canoe, Old Town Canoe, Thompson Brothers Canoe, J.R. Robertson canoe,Penn Yan canoe, Louis Picard canoe, Christian Picard canoe, Kennebec canoe, Cedar canoes, cedar canvas canoes, how to restore an antique canoe, Bearwood Canoes, Carrying Place Canoes, Chestnut Canoe Company, Island Falls Canoe, Northwoods Canoe Company, Skywoods Canoe Company, Stewart River Boatworks, Great Spirit Canoes, Headwaters Canoes, Fletcher Canoes, Noah’s Marine Supply, Wooden Canoe Heritage Association, Lee Valley Tools, Canadian Canoe Museum. “Anyone with a true love for wood canvas construction will appreciate the recent efforts by Mike Elliott of Kettle River Canoes. I’ve been a devoted reader of Mike’s blog for many years now since it first came out in 2009. 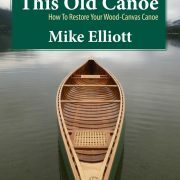 Over the years, Mike has been generously sharing detailed tips and guidance on everything related to canoe restoration. 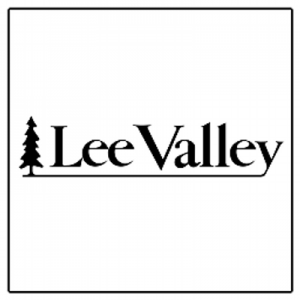 His brief web posts have been a valuable resource to folks who have wanted to tackle a repair on their own boats, especially when online information regarding canoe restoration can been hard to find for the first timer or those intimidated by the job. This Old Canoe is the only book currently published which is entirely devoted to the complex topic of restoration. As such, Mike has been able to cram wonderful tips and lengthy, precise details into a very useful reference publication. 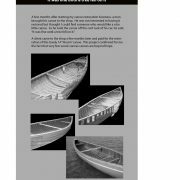 In addition, there are over 300 photos (black and white) that provide much needed visual assistance on the most common repair jobs of wood canvas canoes. 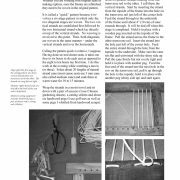 “Elliott’s guide to restoring wood-canvas canoes is organized in a logical manner that traces the restoration process from evaluation to planning, to replacing ribs and canvas, and applying the final coat of paint. Best of all, the softcover format is far more appropriate for shop use than a laptop or tablet. 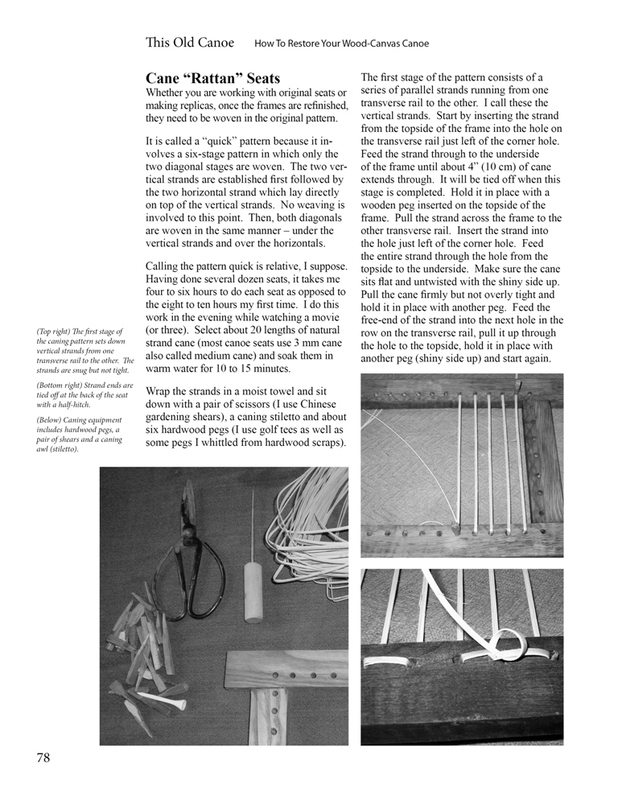 Elliott’s writing is clear and easy to understand for all levels of woodworkers. I’ve always been inspired by his photographs, which illustrate the fact that canoe restoration requires common sense and creativity—not an arsenal of high-priced power tools. What’s more, he makes the procedure of finishing—that is, achieving glossy and durable paint and varnish of a beautiful final product—far less intimidating. It’s clear that Elliott speaks from experience, which is This Old Canoe’s greatest attribute. This old canoe book is very helpful. 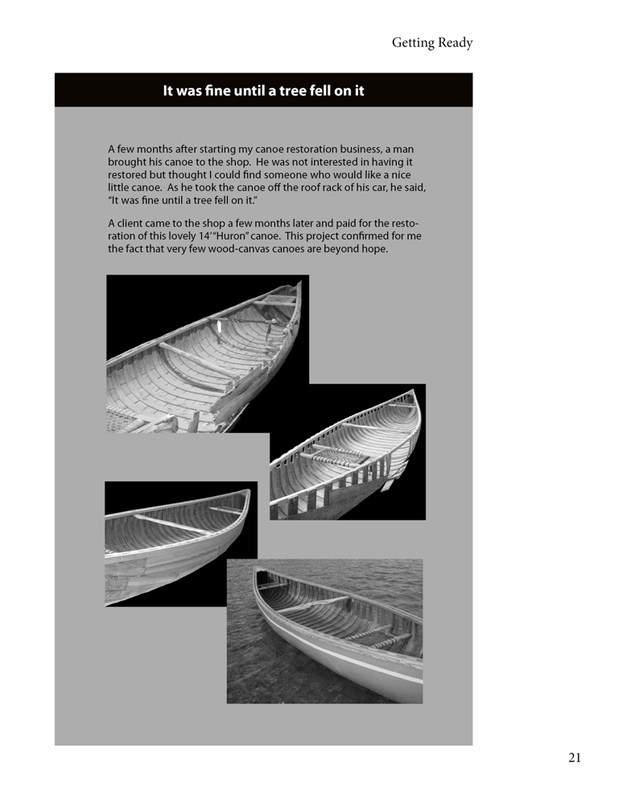 We are repairing and planning to recover our canoe with canvas, following Mike’s step by step directions. Mike suggests using # 10, 14.5 oz/ square yard canvas. We are wondering where he purchases this canvas. We are having difficulty finding it. Would you happen to know where to look? Thank you. In the resources section at the back of the book, I list the canvas supplier I use — Allen’s Canvas in Texas.